Today, we’re going into the Archives to see how the photographs and documents are cared for behind the scenes. Production photographs are taken each year to promote the current season’s shows. 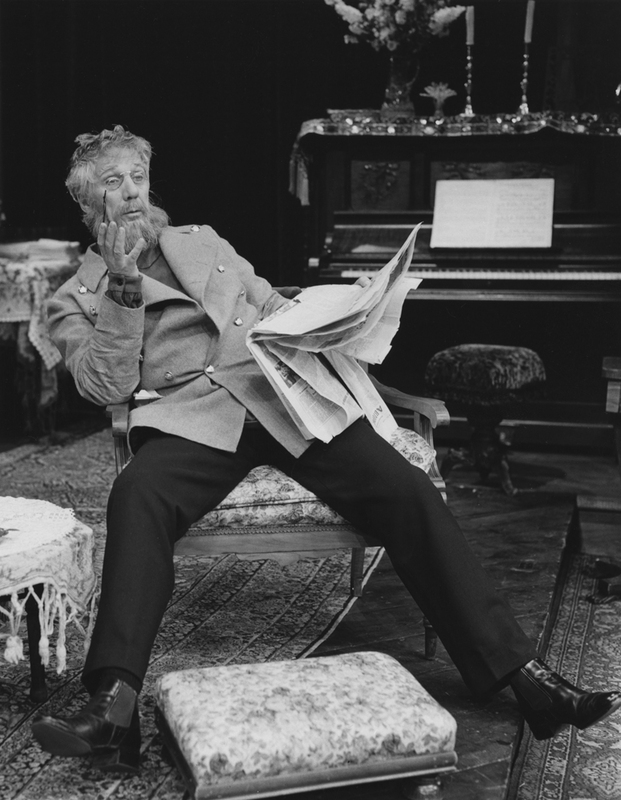 These valuable images have been collected and saved by Stratford Festival employees since the very first show in 1953. 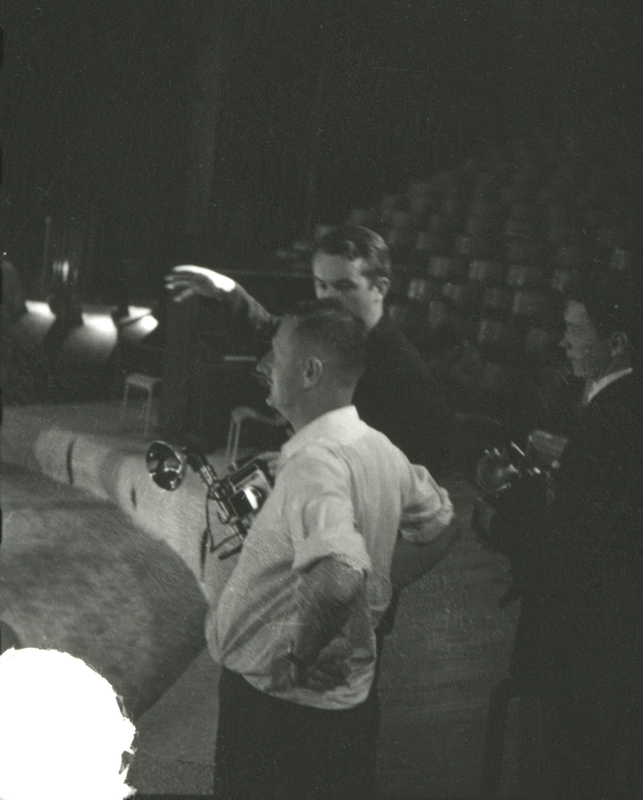 Photo – two unidentified photographers discuss their shots with Director Tyrone Guthrie at the photo calls for 1953’s Richard III, photo by Peter Smith. 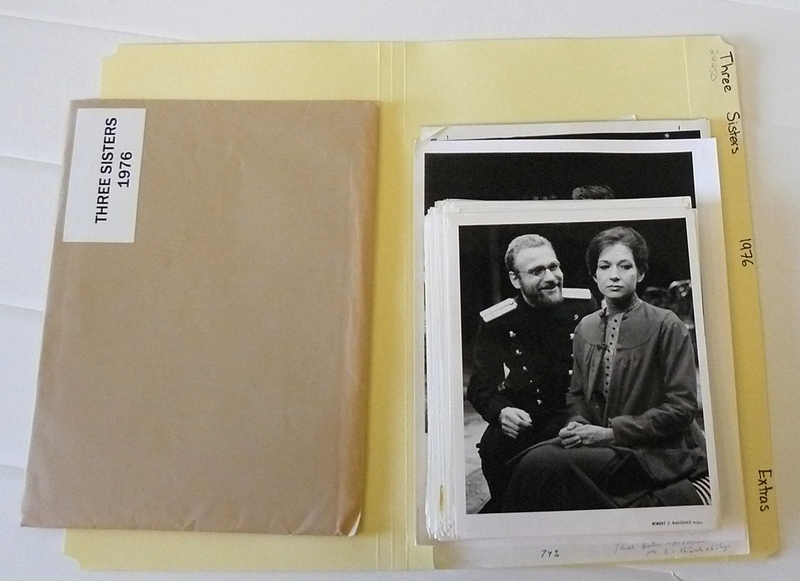 These photo files were and are still requested regularly by researchers, the media and Stratford Festival employees, so items were placed in easy-to-access filing cabinets. To protect these rare vintage prints, the Archives is now removing them from the folders and storing them in acid-free boxes for long-term storage and preservation. High-quality digital scans are being made to provide easy access to Festival staff and other users. The Archives is also cleaning and restoring the prints when necessary. 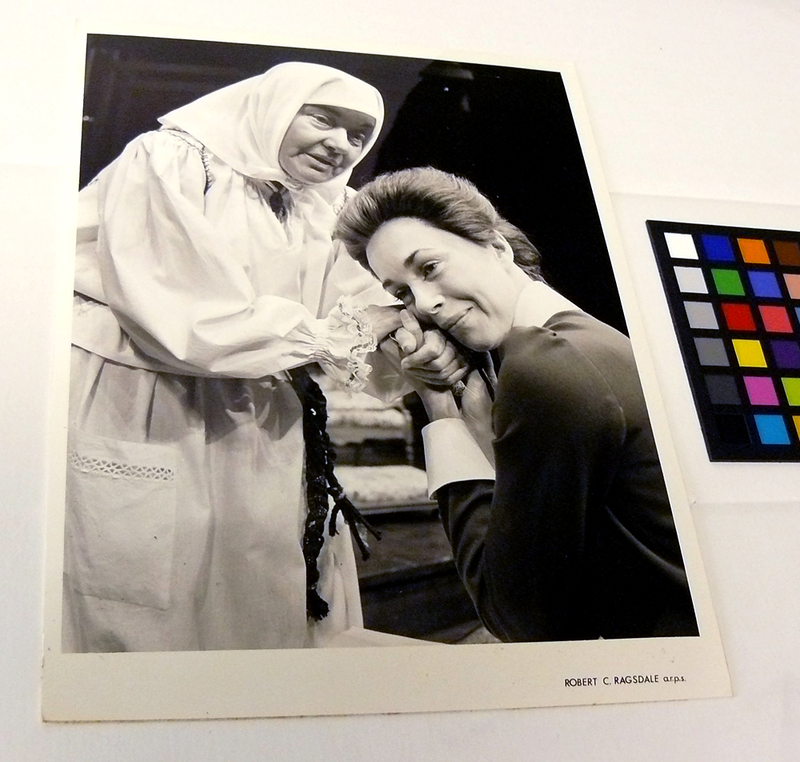 Let’s take you through the process of preserving and cleaning a print with an example from the 1976 production of Three Sisters, part of the 24th season of the Stratford Festival. 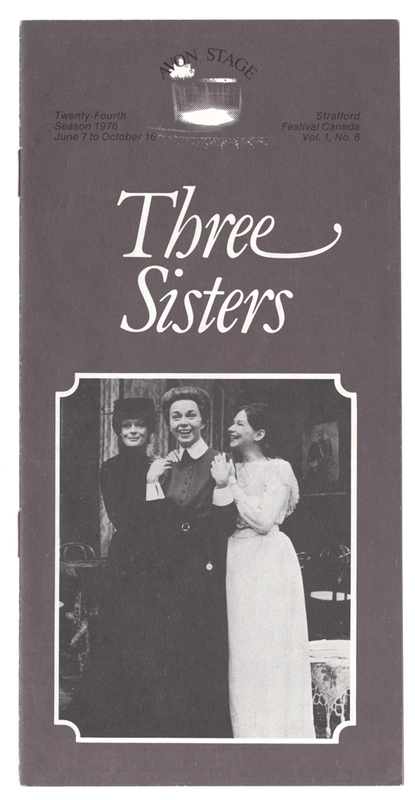 Anton Checkhov’s Three Sisters was produced for the Avon Stage, directed by John Hirsch and designed by Daphne Dare. 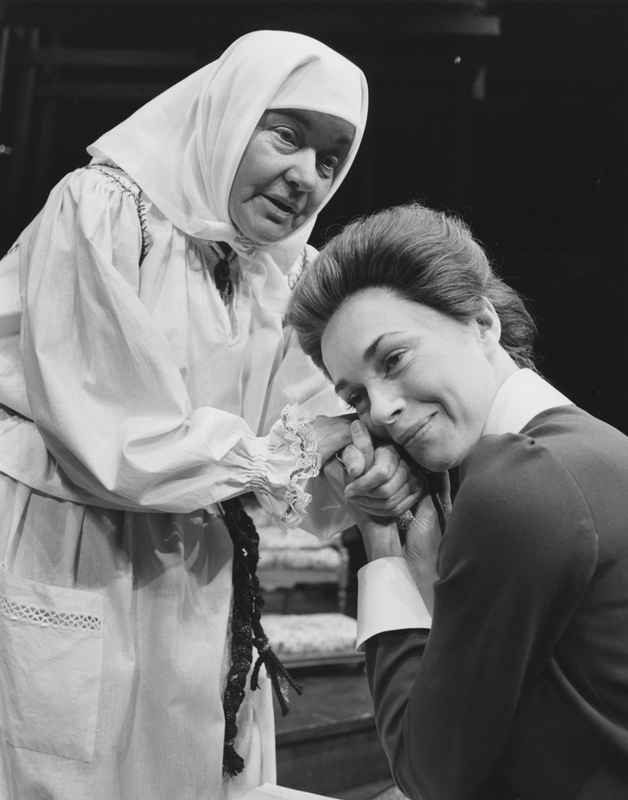 The cast of sisters, from left to right, featured Maggie Smith as Masha, Martha Henry as Olga and Marti Maraden as Irina. Let’s take a look at the Three Sisters file. 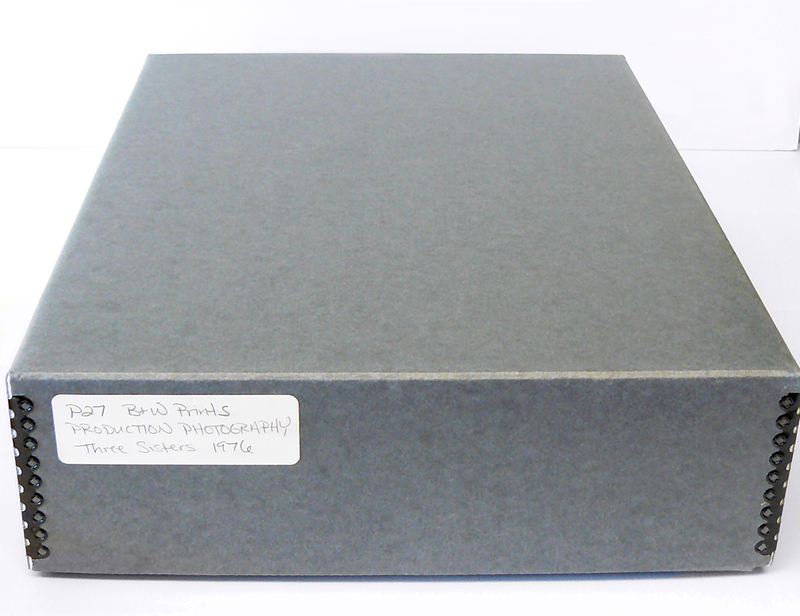 A typical photograph file includes all available prints from a production. The file folders and envelopes are acid-free archival materials, but over time some non-archival materials sneak in… I’m not so sure about this brown envelope. Photo – Michael Liscinsky as Tusenbach and Marti Maraden as Irina, photography by Robert C. Ragsdale. The first step in preservation is to look for duplicate images and evaluate all prints for damage. 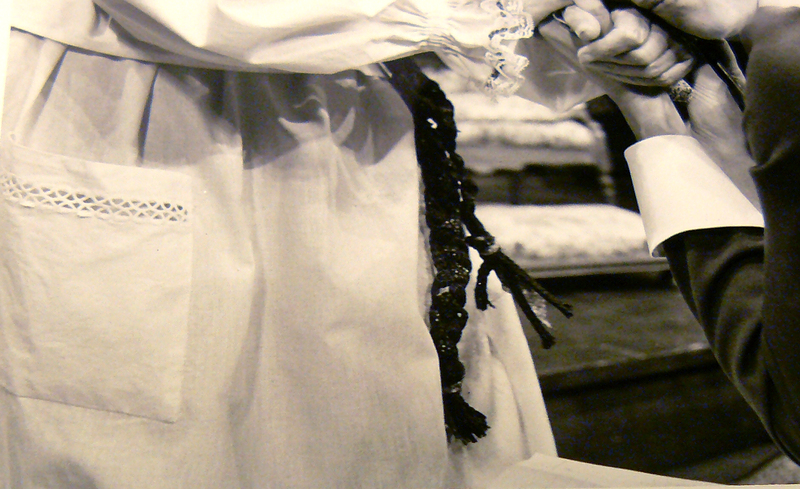 This print of Amelia Hall as Anfisa and Martha Henry as Olga, also taken by Robert Ragsdale, has some stubborn dirt in an obvious white area. We use a special conservation brush, or a scrub of ground-up eraser dust gently rubbed over the image to try and remove the dirt. Don’t try this at home! It’s easier to remove the appearance of dust with Photoshop than to take the scratches out of a print. 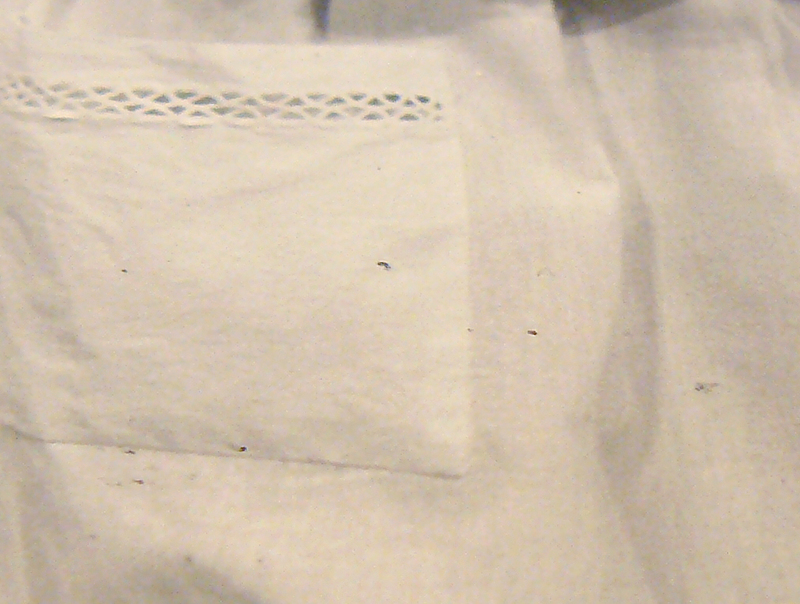 This close-up of Amelia Hall’s skirt shows the dirt is still there. It looks like ink pressed against the emulsion, probably from being stored with typed paper notes. Since the problem is on the surface of the print, we’ll try a chemical emulsion cleaner like PEC-12. We dab a tiny bit of cleaner onto the border of the image to make sure it’s safe to use on this print, and then proceed to lightly dab the problem areas. The stain is wiped away clean! After taking a scan of this print for digital access, the print is stored in an acid-free envelope in an acid-free box. Users are now able to view digital images of the 1976 Three Sisters . The original prints no longer need to be handled often and can be stored in climate and humidity-controlled conditions designed to preserve the rich tonal depth of these photos as long as possible. Here are a few more examples of the stunning prints in our collection of Three Sisters prints by photographer Robert C. Ragsdale. 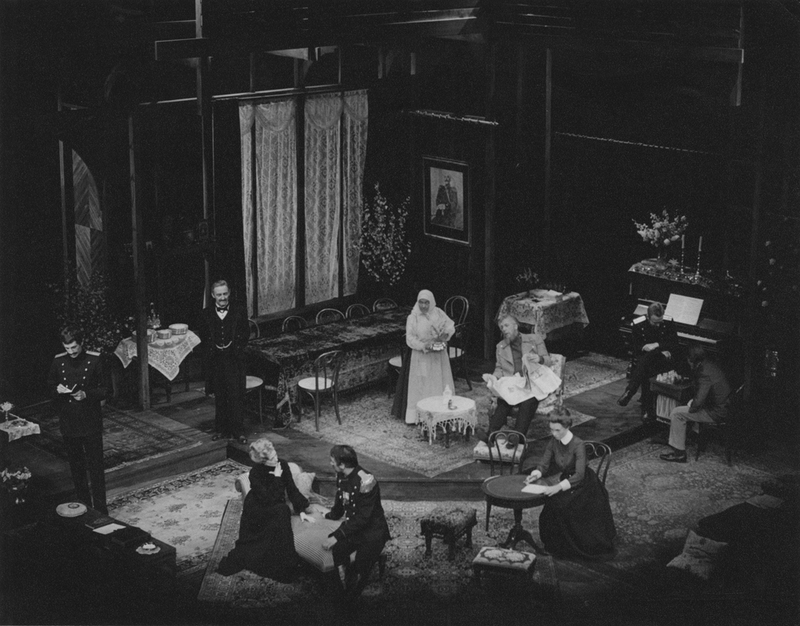 Frank Maraden as Solyony, Maggie Smith as Masha, Keith Baxter as Vershinin, Amelia Hall as Anfisa, William Hutt as Chebutykin, Martha Henry as Olga, Michael Liscinsky as Tusenbach and Alan Scarfe as Andrei. 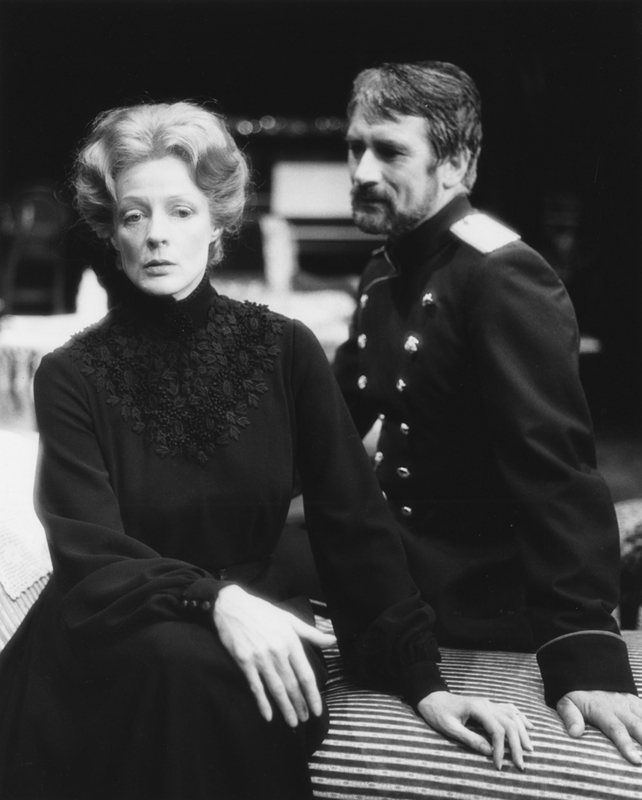 Maggie Smith as Masha and Keith Baxter as Vershinin. 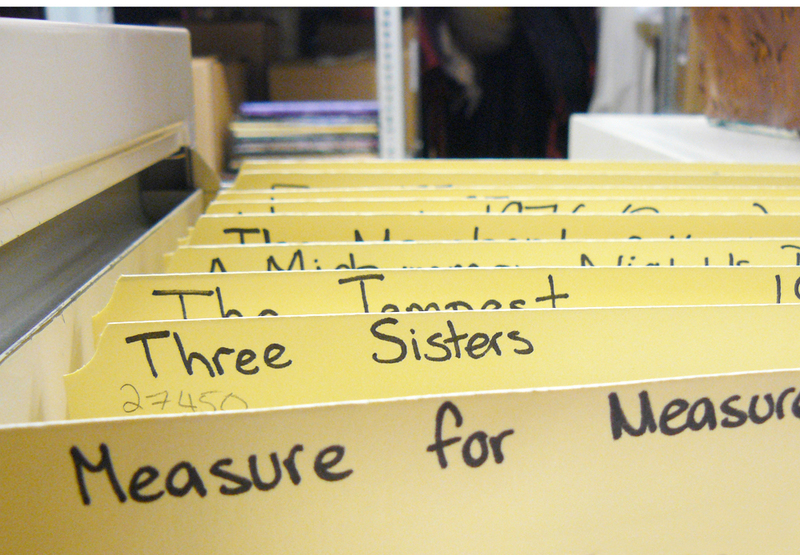 The Archives is open to the public; in-person access and on-site use are free of charge every Monday through Friday, 9 a.m. to 5:00 p.m. For more information about out our Archives, visit our website or call us at 519-271-0055 (local) or 1-800-561-1233 (toll free). 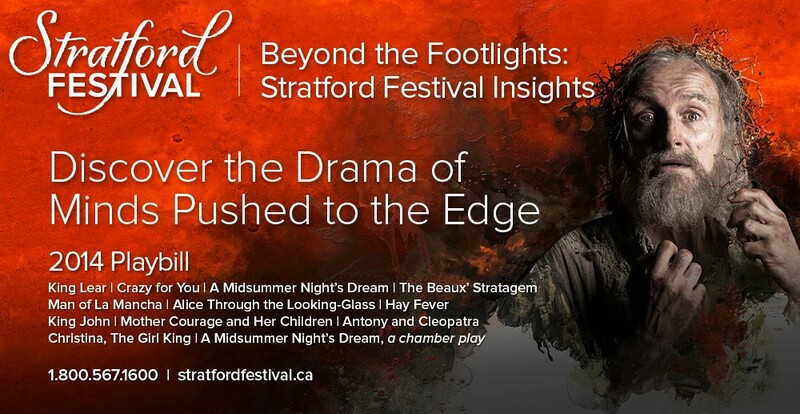 This entry was posted in 2012 Season and tagged Amelia Hall, Anton Chekhov, Archives Stratford Festival, Frank Maraden, John Hirsch, Keith Baxter, Maggie Smith, Martha Henry, Marti Maraden, Michael Liscinsky, Photo archives, Photo preservation, Stratford Festival, Stratford Festival Three Sister, Stratford Shakespeare Festival Checkov, Three Sisters, William Hutt by Stratford Festival. Bookmark the permalink. I took a course in archiving in University. This process sounds fascinating! I have to make it there, still. Very interesting, thanks for sharing this behind-the-scenes activity.